Halloween parades are a fun and festive way to celebrate the spookiest season of the year. Whether you are creating a neighborhood parade or helping put on a school Halloween parade, make sure you start planning early and stay organized. Halloween parades involve a plethora of logistics and starting early - at least a month or so out - allows for enough time to get everything together without getting stressed out. Parades themselves are full of fun and spontaneity, but making the parade happen involves a lot of careful consideration and planning. Here is a list of things to take into account. It may sound obvious, but choosing a date and time for a kid-friendly parade takes some forethought. The younger the kids participating in the parade, the earlier the parade should be. A 4 p.m. parade start time is ideal for younger kiddos if the parade falls on a weekday, since it is after nap time but before dinner and fussy time. On weekends, a mid-morning parade kickoff time is perfect for families with young kids. 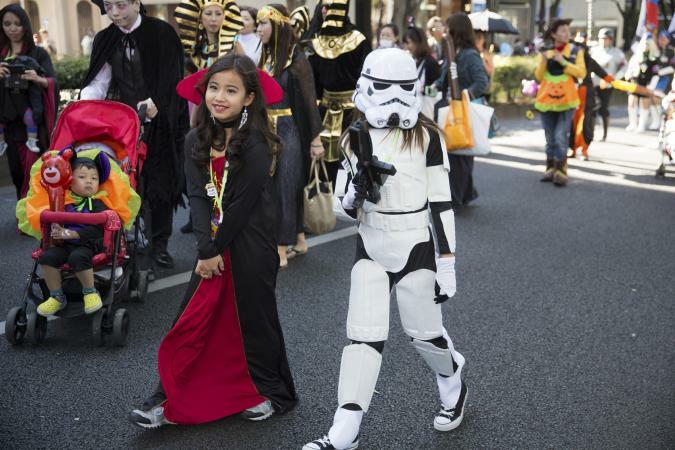 If the parade skews toward older elementary school kids, it could start a bit later - 5 or 6 p.m. is probably okay on a weeknight, and as late as 6:30 pm or 7 pm may be fine for a weekend Halloween parade if your parade location has plenty of lighting. If you live in California or Florida, planning an outdoor parade is probably a piece of cake. New Yorkers or Midwesterners may want to consider contingency plans with a backup indoor location in case of extremely cold temperatures or inclement weather. For folks planning a school parade, the location is probably predetermined. The school yard, sports field, or indoor gym and cafeteria are ideal spots to hold a parade. If the parade is held in a neighborhood, consider whether it should take place in a large yard, down the neighborhood sidewalks, at a community rec center, or in a nearby park. A local pumpkin patch could also be a fun, in-theme setting for a Halloween parade - many pumpkin patches offer a party space for rent that could hold the parade-goers. School Halloween parades are generally safe from traffic since they occur on school property with no car access. However, neighborhood Halloween parades need to take into account the potential for through traffic as people drive the streets during parade time. If possible, a great option to boost safety is to acquire a permit from the city planning office to close off the parade street for two hours or so. If you choose this option, just be sure to inform neighbors living on the street of the planned closure for the parade so they can plan their commute around the event time. Flyers - Flyers work well for neighborhood parades as well as school parades. For school parades, make sure flyers go out to children in the classrooms via a 'backpack express' or folder system through the school's regular communication channels. It's also great to post up flyers on poles in the pickup and drop-off areas of the school so parents see a visual reminder of the event. For neighborhood parades, hand out flyers door-to-door or put them in mailboxes to keep neighbors in the loop. Kids may love dressing up and going door-to-door to hand out the flyers, and it helps get people excited. Invitations - In today's busy world, most parents prefer receiving an email to another piece of mail. On the flip side, kids truly enjoy receiving mail, and if you are hosting a small Halloween parade, it may be fun to have kids create the invites themselves and send them out to their friends. Online invitation services like Evite or Paperless Post have plenty of beautifully designed Halloween-themed cards that are free of charge and will also send reminders to your guests - easy as pie. Now that you have a handle on the important logistics for your parade, it's time to get down to the fun part - creating the parade itself. Using a wireless speaker - Keep in mind that often the music source (such as an iPhone or iPad) should be kept near the speaker to avoid interruption in the streaming. Keep it old school with a boombox and some spooky Halloween songs on repeat. 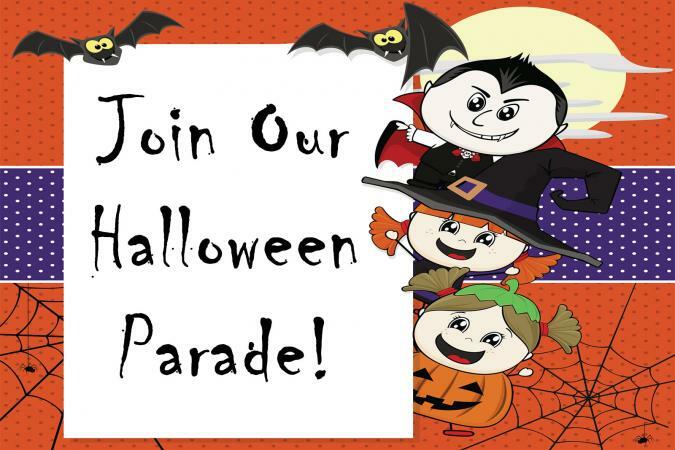 If any of the children participating in the parade are musically inclined, get a few of them together to lead the parade and play Halloween classics like Monster Mash and Thriller. 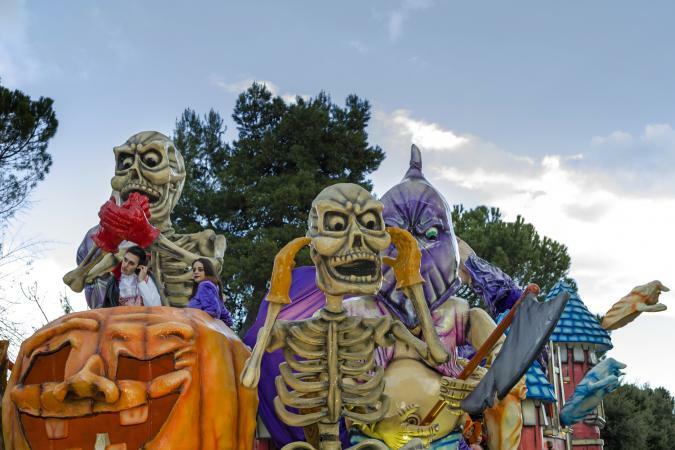 If your parade includes golf carts or cars decorated as floats, tune them all into the same Halloween radio station and blare music from the speakers to pump things up. Floats are a classic element of any parade. The great thing about floats is that they can be as simple or as elaborate as you desire - keep it cheap with streamers, balloons and a bicycle, or go all-out and create floats built onto the back of pickup trucks and golf carts. Strollers - Build onto the stroller by using cardboard, fabric, and decorative materials to transform it into something entirely new. Make a garbage truck and dress your child up as a garbage man, or create a pirate ship with a cardboard surround and some sails, and dress the little one up as a pirate princess. Scooters, trikes and bikes - These are great for younger preschool-aged kids to take on the decorating themselves - provide streamers, balloons, ribbon and tape, and let their imaginations run wild. Kiddie cars - Kid cars can be turned into almost any type of famous vehicle, from a Batmobile with Batman inside to a race car and driver to a Lego car and Lego girl with just a bit of cardboard, paint, and creativity. Wagons - Wagons are perfect for kids who are old enough to decorate or assist in decorating their float. The rectangular base of the wagon has virtually limitless options for decorating. 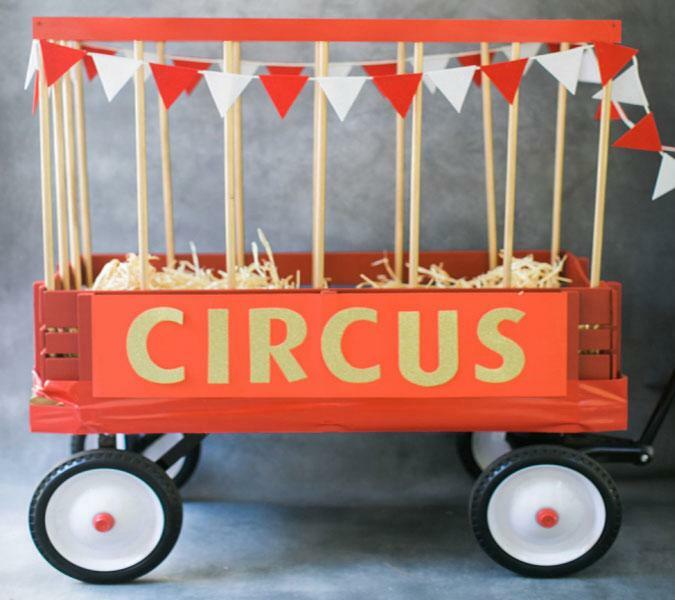 Turn a traditional red wagon into a circus train car with wooden dowels all around the side, a Circus sign affixed to the top, and red flag bunting strung around the edges of the wagon. Have kids inside dress up as the animals, and your circus car is complete. Another fun idea is to turn your wagon into a covered wagon and dress up as early pioneers. Use long, flexible pool noodles to loop over the top and hold up a white sheet for the cover to the wagon, and add real wood around the sides, or paint cardboard to look like wood for the wagon base. Golf carts - For kids who are 10 years old and up, a golf cart parade float can make a big impact. Consider turning a golf cart into Scooby Doo's Mystery Van with cardboard and paint, and dress everyone inside the float as the characters of Scooby Doo for a fun float idea. Cars and trucks - Big parades can even include floats built onto cars and trucks. Truck flatbeds make a great spot to build an elaborate display, such as a graveyard inspired by the Nightmare Before Christmas, or a Dia de los Muertos-themed oferta where kids don elaborate dresses and fancy suits paired with boldly painted faces and flowers in the girls' hair. Make sure to announce the Halloween costume contest in the invitation or flyers for the parade so everyone knows to make their costume choice count. Also announce the different judging categories so kids can plan on different types of costumes that fit a specific category. Costume categories to consider: Scariest Costume, Funniest Costume, Most Creative Costume, Best Group Costume, and Best Overall Costume. Create little skull trophies for winners by gluing a plastic skull on top of a base that announces the category they have won. Create the base by turning over a large paper cup and covering it in patterned paper that aligns with the trophy's respective category. Print out a sheet of paper separately with the category name, then cut it out and paste it onto the cup to complete the trophy. Decorating the skull is another fun way to tie the trophy into its category - put googly eyes or a glasses with attached nose on the skull for the funniest costume trophy, add scary elements like spiders and red blood to the scariest trophy skull, and glue two or more small skulls onto the trophy top for the group costume category. Throwing candy can cause parade watchers to run into the pathway of the parade to gather up the candy. If motorized vehicles are part of your parade, candy throwing should be a no-go. People can get hit with wayward candy or trinkets. A piece of hard candy can seem harmless, but if it pelts down on a toddler's head, it can cause big tears and put a damper on the parade. If you are still considering giving out candy, implement a policy where candy tossers can only hand out candy from hand to hand instead of throwing - it still adds to the festive feel without endangering anyone with flying candy. It can cause a big mess. Candy wrappers, run-over candy and lost trinkets can litter a street long after the parade is over. When handing out candy, be sure to have a quick sweep of the area post-event to be a good citizen. Check with your city to see if there is a ban on parade tossing - Ohio, for example, has implemented a ban on item tossing in more than one town. Be sure to take safety precautions to ensure everyone has a good time. If motorized vehicles as well as strollers and pedestrians are both in the parade, separate them by at least 30 feet to maintain a safe distance. For nighttime parades, ample lighting is a must - consider also handing out glow sticks and reflective tape to the parade participants so everyone is clearly visible in the low light. Finally, if the weather is inclement, be sure to bring umbrellas and avoid having the parade if lighting occurs. Having extra blankets and hand warmers can also be a great idea to keep everyone cozy and comfortable in a chill. By taking proper precautions, planning well in advance and getting creative, your Halloween parade is sure to be a memorable event that everyone will enjoy.